I am Brian Burns, a rising junior from Lafayette, California. I enjoy puzzles and problems of all sorts and am generally curious about how things work or why they are true. I like math, and physics interests me, but I have not taken a formal course in it besides a very basic introduction in ninth grade. I plan on learning some basic mechanics, linear algebra, and maybe a bit of number theory by the end of this summer. 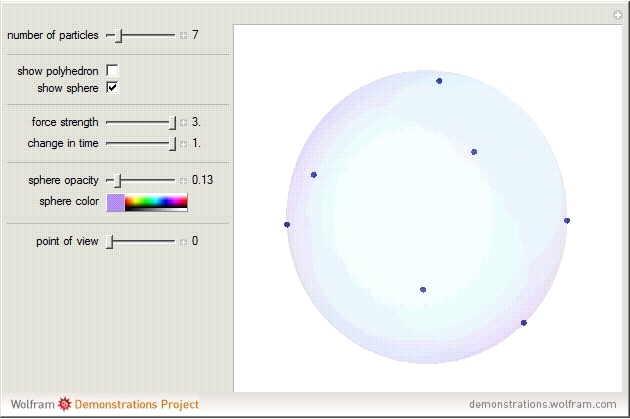 My project simulates particles repelling each other inside the unit sphere. They make really cool polyhedra!